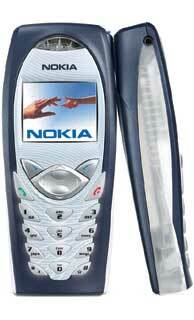 The Nokia 3586i is the CDMA sister phone to the 3595 GSM model. It has the same basic size and shape, the same color screen, but thankfully a normal keypad. It doesn’t have all the same features as the 3595, but most of the basic stuff is there. With the exception of the keypad, it would be hard to tell the 3586i from the 3595, and I presume that is what Nokia had in mind. Regardless of which other phone it might resemble, this is the first Nokia to be offered by a Canadian CDMA provider since the 6185/6188. Both Bell Mobility and Telus were burned by problems in the early versions of these phones, which no doubt caused the long period having no Nokias in the lineup. Was the wait worth it? From the viewpoint of having a CDMA phone with Nokia’s well-respected menu system and feature set it most certainly is. From the viewpoint of having a CDMA phone that is head and shoulders above the rest in terms of sound quality, then sadly no. I’ll get into the sound quality issue later on. Because of the striking similarities between the 3586i and the 3595, I have lifted some of this review directly from the 3595 review. There was no point saying anything different, since these aspects of the phone are truly identical. The color screen is a bit odd, in that it seems to be nothing more than a colorized version of the monochrome display found on the 3590 GSM model (and indeed many other non-color Nokia phones). It therefore has perhaps the lowest resolution of any color display on the market at this time, and as a result it looks rather blocky. Additionally, the pixels look a tad fuzzy. Nokia didn’t even bother to create a new menu scheme for the phone. They simple added color to the old Series 30 menu system, and left it at that. The only real extra they give you is the ability to display low-resolution color images on the background of the idle screen. To its credit, the 3 supplied games make good use of the display and its color. Unlike the 3595 however, the backlight on the 3586i is refreshingly WHITE. Those of you who haven’t read my review of the 3595 won’t therefore have known that its backlight has a decidedly yellow tint to it. Not so with the 3586i. The display is visible in direct sunlight, but the screen is generally too dark to see outdoors without the backlight on. Even then, it is sometimes difficult to see, since the backlight just isn’t bright enough. The polyphonic ringtones on the 3586i are super-loud. They are without a doubt one of the loudest polyphonic tones I’ve heard on any phone. They may even be louder than the 3595, but since I didn’t have one to test side-by-side, I couldn’t be absolutely sure. Battery life is about what you’d expect from a color phone, which is to say short. During my test period I never ran the battery down fully before recharging, but based on the battery meter readings it didn’t appear as though one can expect much more than 2 days of standby. It will probably be far less if you play games, or do other things that make extensive use of the backlight. RF performance is perhaps one of the phone’s greatest features. While I couldn’t compare it directly to an Ericsson T206 (even if I wanted to, as the T206 works only on Telus, and the 3586i works only on Bell Mobility) the Nokia beat my ST-7868W so thoroughly that I’d have to say I was impressed. I strongly suspect that if a 3586i – T206 comparison could be made, the 3586i would come off looking at least as good. The phone comes with a hide-a-way pull-up antenna. When pushed down the phone seems like any of those antenna-less models you see quite frequently these days. My testing revealed that at 1900 MHz it makes almost no difference whether you use the internal antenna or pull up the external antenna. I never got a chance to test the phone in an 800 MHz area, but my guess is that the pulled up antenna will make a lot more a difference there. When using the phone in a 1900 MHz environment it’s probably more convenient to leave the antenna down, and you’ll pay no penalty for that. Unfortunately the phone doesn’t back up its stellar RF performance with stellar audio. While the tonal balance of the phone is actually very good, it can’t make up for the fact that sound reproduction is sub-par. The nuances of speech have a decidedly raspy quality to them, and while this probably has a lot to do with the limitations of the EVRC CODEC, it doesn’t explain why other Bell phones (such as the Samsung N370) or Telus phones (such as the Ericsson T206) do so much better at this. After many days of taking and making calls with the 3586i I was thoroughly disappointed. The audio quality wasn’t horrible per se, but it was bad enough that it drove me totally up the wall. Less picky users might not find this as objectionable as I did, especially if they’d cut off their right arm to have a Nokia. Those with somewhat more discerning ears might do well to avoid this one. I should pause for a moment to make a distinction between tonal balance and sound reproduction. Tonal balance is, as the name implies, the balance between various frequencies in the audio spectrum. A phone with poor tonal balance might sound tinny, or boomy, or shrill, or muddy. Sound reproduction on the other hand refers to the phone’s ability to FAITHFULLY reconstruct the actual sound. In a phone with excellent reproduction, each nuance of speech (“s” sounds, “f” sounds, etc) should clear and DISTINCT. Most people can readily tell the difference between a phone with good tonal balance and one with bad tonal balance (if they can hear these phones back-to-back). A phone with good tonal balance but poor sound reproduction will probably SEEM better to an average user than a phone with poor tonal balance and excellent sound reproduction. Therefore, I think the 3586i will probably go down well with less discerning users. Earpiece volume is only average. While it isn’t particularly faint, it isn’t particularly loud either. Unlike other Nokia models, the 3586i doesn’t seem to have their volume boost feature. This is where the earpiece volume is boosted by about 3 or 4 dB (even at the highest setting) when loud background noise is detected. Outgoing audio wasn’t too great either, but it wasn’t any worse than MOST of the other 1x phones I’ve tested. Background noise easily damaged the audio, and best word to describe what your callers have to put up with is WEIRD. The only two 1x phones I’ve tested that seem to have good outgoing audio are the Motorola T731 and the Samsung N370. In the end, the Nokia 3586i isn’t really that big a deal, unless having a phone with the Nokia menu system IS a big deal to you. It’s an okay lower-to-mid range phone with excellent RF performance. It just doesn’t sound as good it could.